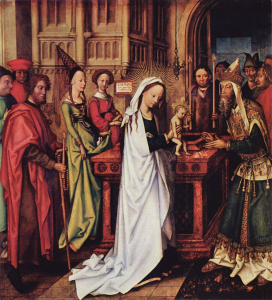 February 2nd marks the feast day known variously as Candlemas (sometimes spelled Candlemass), the Feast of the Presentation of Our Lord Jesus, and the Feast of the Purification of the Blessed Virgin Mary. Our Book of Common Prayer (see the table page xliv) and Hymnal uses the latter term, which reflects the reason for Mary and Joseph’s presentation of their Son as prescribed in Leviticus 12. It is an event in the life of Jesus that has been depicted in countless paintings and icons. Musically, every setting of the Nunc dimittis — the song Simeon uttered on this occasion — commemorates this moment and its cosmic significance. For full of comfort is my heart; soft reposing. So the Lord hath promised me, and death is but a slumber. Our opening hymn, “Hail to the Lord who comes,” is a text by Anglican priest John Ellerton (1826-1893). Ellerton began his career as a curate by writing hymns for the children of the parish. This hymn is one of them. His text reflects the same eschatological hope rooted in the Light of Christ that Simeon’s song does. The tune, OLD HUNDRED TWENTIETH, has appeared in English hymnals and psalters since at least 1570. Our sermon hymn, “In peace and joy I now depart,” includes all four verses of Luther’s paraphrase of Simeon’s song (read more here; you’ll be glad you did). Our Communion motet is a setting of Ave verum corpus by Francisco de Peñalosa (c.1470-1528), one of the most important Spanish composers of the early sixteenth century. You can hear some harmonic features in this piece that identify it as a work from the early Renaissance. Our Communion hymns include “Deck thyself, my soul, with gladness,” about which you may read more here. Our closing hymn, “Thine arm, O Lord, in days of old,” reflects on healing miracles of Jesus as recorded in the Gospel reading for today’s service from St. Matthew 8. The text was written by Edward Hayes Plumptre (1821-1891) who served as chaplain at King’s College, Oxford. This hymn was first published in leaflet form for use in the hospital chapel at King’s College.